Mr Jeff Ecker has over 35 years experience specialising in hand and wrist conditions. Recognised as one of the few surgeons competent in all aspects of hand and wrist surgery, he has authored scientific research articles and book chapters in the field of upper limb surgery. He is regularly invited to present and teach his outcomes and research at international and national scientific meetings. Treatment is tailored to the individual’s condition/s and circumstances to provide the best possible outcomes. 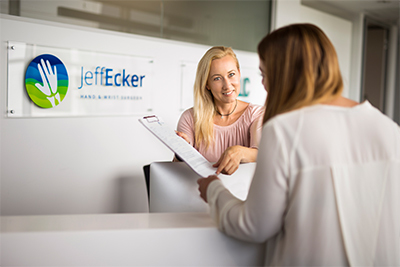 Mr Ecker is often called upon to operate on some of the most challenging injuries, disorders and corrective reconstructive work. By request, Mr Ecker will consult international patients. His specialist interest is the treatment of complex wrist problems, including scaphoid fractures, fracture non-unions and wrist arthroscopy. He has played a leading role in introducing and refining techniques for arthroscopic wrist surgery, and performed the world’s first supraretinacular endoscopic carpal tunnel release – a revolutionary technique he developed which eliminates the risk of damaging the median nerve. Mr Jeff Ecker has been recognised for his excellence by numerous national and international organisations. As a result he is often called upon to present his research findings at international scientific meetings and publish his impressive outcomes. Mr Ecker has been invited the following Hand and Wrist Scientific meetings for 2018. Mr Ecker has been invited the following Hand and Wrist Scientific meetings. Comparison of Arthroscopic & Vascularised Medial Femoral Condyle Bone Grafts for Non Union of the Scaphoid with ‘Humpback Deformity’. Ecker, J., & Andrijich, C. (2015). Journal of Hand Surgery (European Volume), 40(E). S1-S197. Partial and Full-Thickness Tears of Flexor Carpi Radialis Complicating Excision Arthroplasty and Suspensionplasty of the Trapezium to Treat Trapeziometacarpal Joint Arthritis. Suparetinacular Endoscopic Carpal Tunnel Release. Ecker, J., & Perera, N. (2013). Journal of Hand Surgery (European Volume), 38(E), S1-S99. Mr Jeff Ecker’s primary clinic is located in Bethesda. Mr Jeff Ecker provides non emergency consults and emergency consults for trauma patients, including Workers’ Compensation and private patients 24/7.